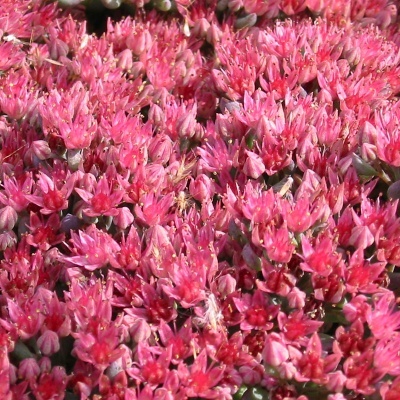 A variety of Sedum and close relatives for well drained soil in sun. Varied plants they are all good survivors if we ever get a hot dry summer again! 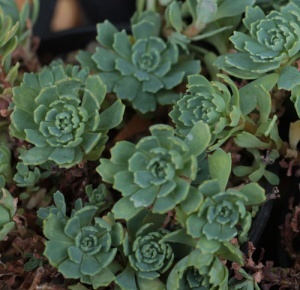 We grow two main types; low growing alpine type carpeters and more upright herbaceous perennials. All are perfectly hardy in the UK, even in the very cold recent winters. 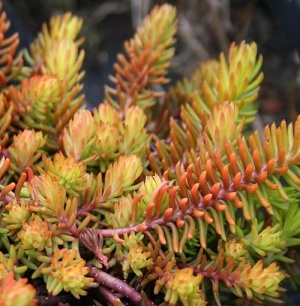 Most forms have attractive foliage and this is often the main reson for growing them, the colour of the leaves often changing during the season. The flowers are the main attraction on the bigger herbaceous types and it is well worth remembering that the seedheads will be attractive to insects, birds and the eye throughout autumn and winter to so don't be too quick to cut them back. 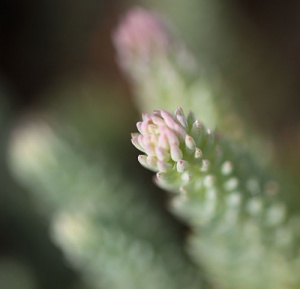 All sedums need reasonable drainage and benefit from full sun all year. Low mats of blue-grey rosettes make a lovely feature for a rockery or front of border. White flowers when it can be bothered. 10cm. Full sun and well drained soil. A new blue-grey leafed plant making low carpets for a well drained soil in full sun. Yellow flowers in summer to 15cm. 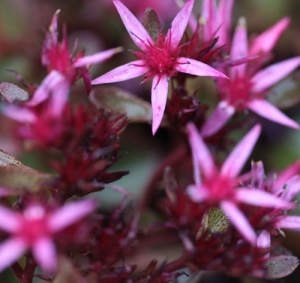 Low mats of leaden grey foliage produce heads of rich rosy pink-red flowers in summer. More or less trailing habit ideal for raised beds, rockeries, containers and the front of borders. Drained soil in full sun. 10cm. A new yellow leaved form from Austria. Prostrate, with bright yellow flowers. Dry soil in sun. Foliage turns bright amber in winter. Not to be confused with S. â€˜Gold Moundâ€™ which looks the same but is not hardy. A sprawling, low growing mat with green leaves strongly flushed reddish purple and glowing pink-purple flowers in late summer and autumn. Drained soil in sun. 10cm.